Sunderland manager Gus Poyet says his side need to rediscover the "missed connection" with fans to help improve form. Some Black Cats fans booed their team off after they were held to a 0-0 draw in the FA Cup fourth round by Fulham. 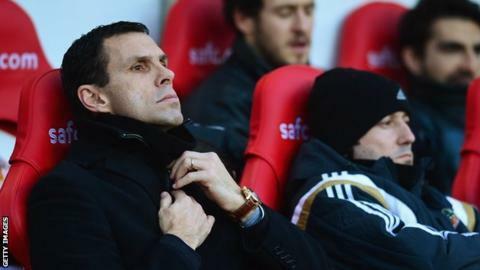 Poyet raised concerns about his team's playing style but also urged patience from supporters. "I think the fans want Niall Quinn and Kevin Phillips back but they are not playing anymore," the 47-year-old said. Sunderland face a replay against Championship side Fulham, while they also try to avoid Premier League relegation. Poyet's side are one point above the bottom three in the top flight having lost four of their last five league games and drawn the other. "There are plenty of things that we need to change because if not, it's going to be difficult," the Uruguayan said. He added there was a "missed connection at the moment with the fans". "There are players who need the famous 'confidence' word for them to be better and when the stadium is not happy, the players don't express themselves and that makes kick and rush very easy. "Teams who play kick and rush is something I wouldn't like to watch week in, week out, so we are going to try to find a formula to pass the ball better and forwards - but yes, passing the ball, so a little bit of understanding and patience, it would be very welcome."